I was going to describe what happened on this play, how it looks like Butler and Towns were setting up some sort of double-screen action when Jamal Crawford audibled to Derrick Rose out on the wing, but instead it’s better to spend the rest of the day howling in uncontrollable laughter. My advice is to watch this GIF however many times it takes to start chuckling at the sight of Rose’s hair flopping around as he “bursts” into his busted little hesitation crossover, and then to keep watching it forever. The shot clock has 13 seconds left on it when Rose attempts this hopeless shot! Thirteen seconds, and he’s taking a spastic sideways fadeaway jumper that wouldn’t qualify as a good look on a buzzer-beater. That’s 13 seconds the Timberwolves could have spent working to get either one of their two All-Stars meaningfully involved in the offense. Instead, there’s Towns, watching helplessly from out near the top of the key; there’s Butler, flatfooted in the far corner, a good 30 feet from the action. Anyway, back to the numbers. Towns averaged 21.3 points on 14.3 shot attempts per game this season. He attempted nine shots last night, and hit two of them as he finished with five points. Through two games of this series, he has scored 13 points, on 18 shot attempts. He is shooting 28 percent from the floor. Jimmy Butler averaged 22.2 points on 15.6 shot attempts per game this season. He attempted six shots last night, and hit three of them as he scraped together 11 points. Through two games of this series, he has scored 24 points, on 17 shot attempts. He is shooting 41 percent from the floor. Literally anyone can take that horrendous shot, which, like Rose’s eerily similar and similarly dead-ended fadeaway from up above, came with plenty of time on the shot clock to hunt around for really any other look at the basket. If the Timberwolves are going to settle for that shot, they are going to get killed under any circumstances. But even if you accept the shot, there’s no sensible reason why they’d need Dieng—a mediocre jump-shooter even when not off-balance and launching himself backward off a hopeless little shoulder-shimmy that fooled nobody—taking it, rather than Butler or Towns. 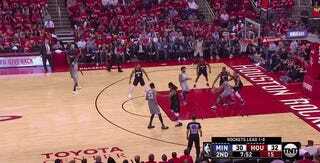 Sure, yes, the Rockets are playing good defense, and that explains why Butler and Towns aren’t playing as well as they usually do, but they’re at least as good at taking pointlessly frantic desperation heaves early in the shot clock as Gorgui frickin’ Dieng—and a good deal better than Gorgui frickin’ Dieng at finding better shots than that. Maybe you have an impulse to point out that neither Towns nor Butler is on the court in the GIF of Dieng’s shot. But this is a very funny and ironic part of the problem, given coach Tom Thibodeau’s notorious over-reliance on his starters: There’s no sensible reason why Thibodeau would need to run out the gruesome fivesome of Tyus Jones-Jamal Crawford-Andrew Wiggins-Gorgui Dieng-Nemanja Bjelica, in the first quarter or at literally any other time, instead of staggering his two All-Stars’ minutes so one of them can anchor that group and be the focal point of the offense. It’s not some insane stretch to imagine that if the Wolves had had Jimmy Butler on the floor for that possession, the team could have moved the ball around enough in the remaining dozen seconds of shot clock to find something better than having Dieng shotput the ball out of Nene’s armpit. Maybe it doesn’t matter. The Rockets were overwhelming favorites to advance no matter what. But apart from the fairly obvious outcome, this series’ main intrigue was the chance to see how Minnesota’s fresh, talented, and unproven core would respond to its first playoff test. The impression so far is that they’re not even being allowed to take it. They’re being asked to stand aside so that Derrick Rose and Jamal Crawford can take it for them. It’s all baffling. Why, after a season of riding its starters into the dirt, has Minnesota suddenly discovered a passion for egalitarian playing-time distribution that would make a youth soccer coach roll his eyes? Why have Butler and Towns suddenly become the team’s fourth and fifth scoring options, respectively, after carrying the team on their backs to the playoffs? Why has nobody done the only right thing to do and duct-taped Rose to the locker room ceiling so he can’t touch the ball or the court? 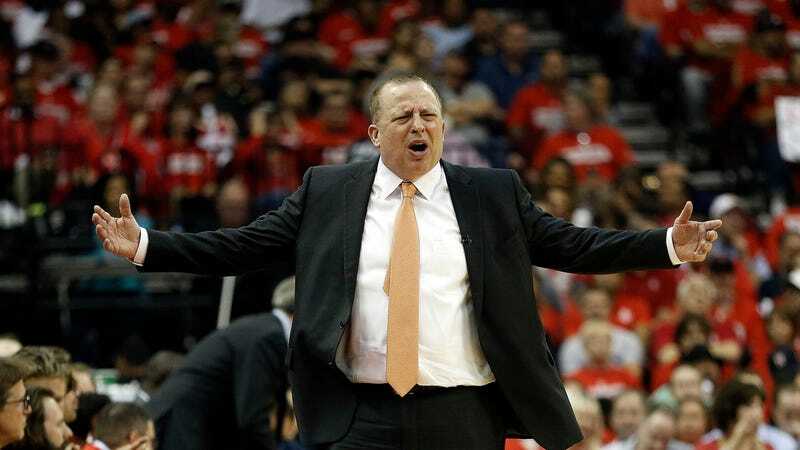 I have no answers, only the growing certainty that neither does Tom Thibodeau.